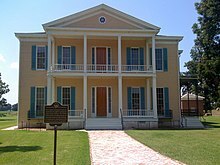 Highway 142 (AR 142) is a north–south state highway in Chicot County, Arkansas. The route starts its southern terminus at Levee Road near Lakeport. The road then travels north, passing through the Lakeport Plantation. It ends at its northern terminus at U.S. Route 82 (US 82) and US 278 in Shives. AR 142 was designated in 1931, from US 61 to the Mississippi River, and part of the route was redesignated as part of US 82 in 1940. The route was paved in asphalt by 1962. The route is maintained by the Arkansas Department of Transportation (ArDOT). All of the route is in Chicot County. In 2016, the Arkansas State Highway and Transportation Department (AHTD) measured about 410 vehicles travelling near US 82 and US 278 on average each day. AR 142 starts at Levee Road (CR 73), near the unincorporated area of Lakeport. The route begins travelling westward until it reaches a graded road, where it turns northwest. The road travels through farmland, intersecting Black Water Road (CR 72) which leads to Eminence. The road then crosses over Weaver and Eminence Bayous, and it turns west near the Lakeport Plantation. After travelling westward shortly, AR 142 turns north at Robert Mazzanti Road. The road then crosses over a drainage ditch, and it intersects James Roy Road afterwards. Near Shives, the route turns west past a gravel road. AR 142 ends at its intersection with US 82 and US 278 at the center of Shives. Past the intersection, the road continues to Lakehall Road (CR 71). AR 142 was designated in 1931, along a gravel road starting from US 61 southeast of Lake Village, to a point west of the Mississippi River. The route was realigned onto a new unimproved road near its southern terminus in 1939, which was paved in gravel by 1940. The section near Lake Village became part of US 82 and was paved in asphalt that year. In 1952, AR 142 was connected to a county road that extended to Grand Lake, which was removed eight years later. The route was completely paved in asphalt by 1962, which cost $214,999 (equivalent to $1,802,592 in 2018). The entire route is in Chicot County. ^ a b System Information and Research Division (2014). "Arkansas Road Log Database" (MDB (inside ZIP)). Arkansas State Highway and Transportation Department. Retrieved March 27, 2016. ^ a b c d e Arkansas State Highway and Transportation Department (2015). Chicot County, Arkansas (PDF) (Map). Arkansas State Highway and Transportation Department. Retrieved April 16, 2017. ^ Daily Traffic Estimates – Chicot County, Arkansas (PDF) (Map). Cartography by Arkansas State Highway and Transportation Department. Arkansas State Highway and Transportation Department. 2015. Retrieved April 16, 2017. ^ a b c d e f g Google (April 15, 2017). "Arkansas Highway 142" (Map). Google Maps. Google. Retrieved April 15, 2017. ^ Official Highway Service Map (TIFF) (Map). Cartography by Arkansas State Highway Commission. Arkansas State Highway Commission. 1930. Retrieved April 15, 2017. ^ Official Highway Service Map (TIFF) (Map). Cartography by Arkansas State Highway Commission. Arkansas State Highway Commission. 1931. Retrieved April 15, 2017. ^ Official Highway Service Map (TIFF) (Map). Cartography by Arkansas State Highway Commission. Arkansas State Highway Commission. 1938. Retrieved April 15, 2017. ^ a b Official Highway Map (TIFF) (Map). Cartography by Arkansas State Highway Commission. Arkansas State Highway Commission. 1939. Retrieved April 15, 2017. ^ Map of the State Highway System of Arkansas (TIFF) (Map). Cartography by Arkansas State Highway Commission. Arkansas State Highway Commission. 1940. Retrieved April 15, 2017. ^ Official Highway Map of Arkansas (TIFF) (Map). Cartography by Arkansas State Highway Commission. Arkansas State Highway Commission. 1951. Retrieved April 15, 2017. ^ Official Highway Map of Arkansas (TIFF) (Map). Cartography by Arkansas State Highway Commission. Arkansas State Highway Commission. 1952. Retrieved April 15, 2017. ^ Highway Map of Arkansas (TIFF) (Map). Cartography by Arkansas State Highway Commission. Arkansas State Highway Commission. 1959. Retrieved April 15, 2017. ^ Highway Map of Arkansas (TIFF) (Map). Cartography by Arkansas State Highway Department. Arkansas State Highway Department. 1960. Retrieved April 15, 2017. ^ Highway Map of Arkansas (TIFF) (Map). Cartography by Arkansas State Highway Department. Arkansas State Highway Department. 1961. Retrieved April 15, 2017. ^ Highway Map of Arkansas (TIFF) (Map). Cartography by Arkansas State Highway Department. Arkansas State Highway Department. 1962. Retrieved April 15, 2017. ^ "Contract Let for County Road Paving". Hope Star. Hope, Arkansas. September 7, 1961. p. 2. Retrieved April 16, 2017 – via Newspapers.com. This page was last edited on 19 May 2018, at 22:55 (UTC).